We are happy to announce the public preview of support for Cosmos DB in the Azure Storage Explorer (ASE). 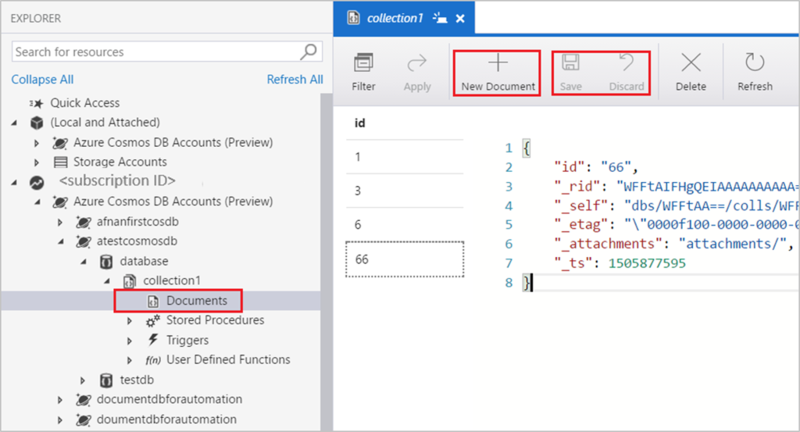 With this release Cosmos DB databases can be explored and managed with the same consistent user experiences that make ASE a powerful developer tool for managing Azure storage. The extension allows you to manage Cosmos DB entities, manipulate data, create and update stored procedures, triggers, as well as User Defined Functions. Azure Storage Explorer not only offers unified developer experiences for inserting, querying, and managing your Azure Cosmos DB data, but also provides an editor with syntax highlighting and suggestions for authoring your Cosmos DB stored procedures. With this extension you are now able to browse Cosmos DB resources across both Document DB and Mongo DB interfaces along-side existing experiences for Azure Blobs, tables, files, and queues in ASE. Learn more about today’s announcements on the Azure blog. Discover more Azure service updates. If you have questions, feedback, comments, or bug reports, please use the comments below or send a note to cosmosdbtooling@microsoft.com.